Gluten Free Every Day is ideal for those newly diagnosed with celiac disease. Landolphi’s wife, Angela, was the inspiration for this book. Angela suffered for years before realizing she was gluten-intolerant. Using his culinary training, Landolphi wrote Gluten Free Every Day to ensure that his wife could still enjoy the foods she loved, including macaroni and cheese, onion rings, baked goods and other sweets. Try the Cheddar and Chive Biscuits! They are flavorful, flaky and have just the right fluffy biscuit texture that you would expect from biscuits made from wheat—but they are wheat-free. 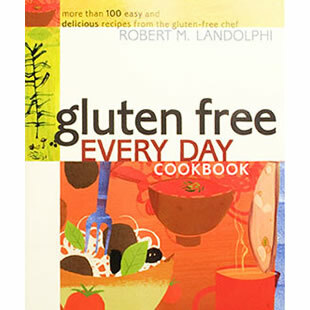 In the first chapter of the book, the author provides complete nutrition information for ingredients that are commonly used in gluten-free cooking and baking. And he provides a list of “safe” alternative brands for everyday foods that typically contain gluten, such as crackers, oats, pasta and beer. Preheat the oven to 425°F. Butter a baking sheet. In a medium bowl, combine the brown rice flour, sweet rice flour, quinoa flour, tapioca flour, potato starch, baking powder, baking soda, salt, and xanthan gum. Using your fingers, a pastry blender, or two dinner knives, cut the shortening and butter into the flour mixture until the mixture is coarse and crumbly. Stir in the egg, cheese, and chives until blended. Stir in the buttermilk just until the ingredients are moistened. Drop 1/4-cup scoops of dough 1 inch apart onto the prepared pan. Bake for 15 to 20 minutes, or until golden brown. Remove from the oven and let cool slightly on wire racks before serving. Add 5 slices crisply cooked and crumbled bacon along with the cheese.